I am so excited the you are here. 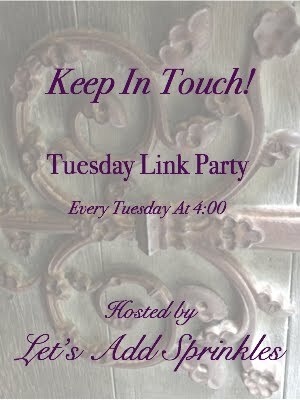 I want to say a big thank you to Amber for organizing another fabulous blog hop. These are such fun events. 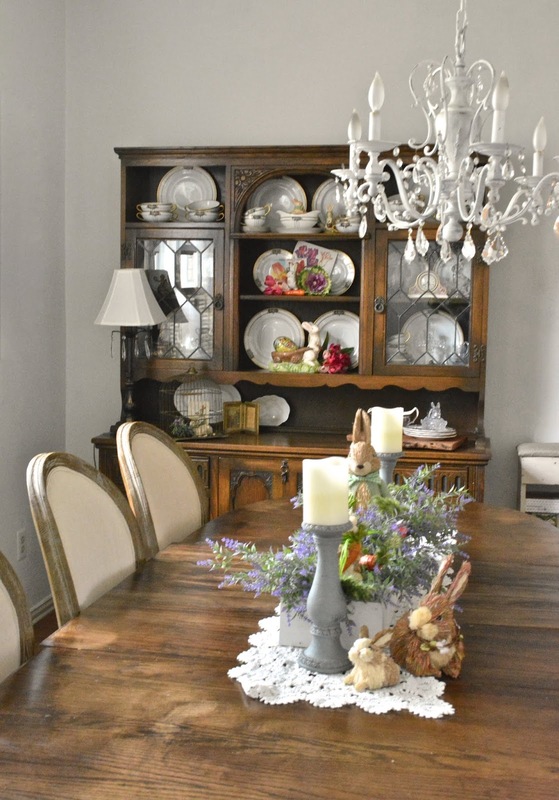 It's great to see other bloggers that share a love for seasonal and holiday decor. If you are coming from The Painted Hinge ,welcome. 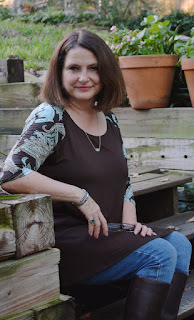 Don't you love Michelle's cute, rustic and farmhouse style? So fun. I've had a lot of fun adding vintage elements to my Easter decor this year. I have a big birthday rushing toward me later this spring and I'm feeling very vintage. I always looked forward to Easter. It always meant a new dress, new shoes, a new hat, and maybe even a new little handbag. 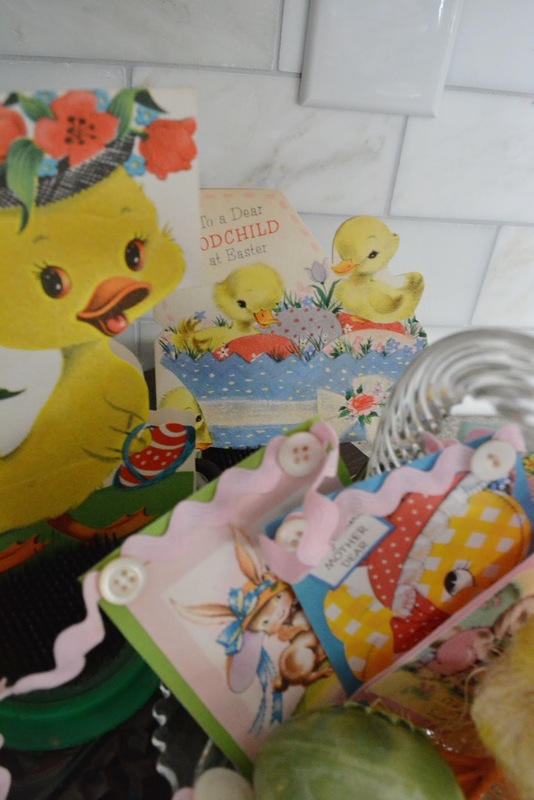 Vintage Easter decor brings back memories of those early years and there are so many fun motifs to use. I've been really into ducks and ducklings. Something new this year came from an antique mall out in East Texas. 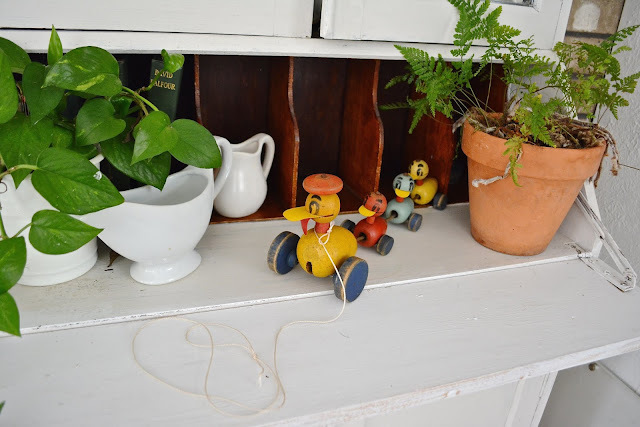 When I saw a Fisher Price pull toy from the 1950s, I just had to have it. It's just too cute.The duck family waddles when you pull it. I will love this for years to come. 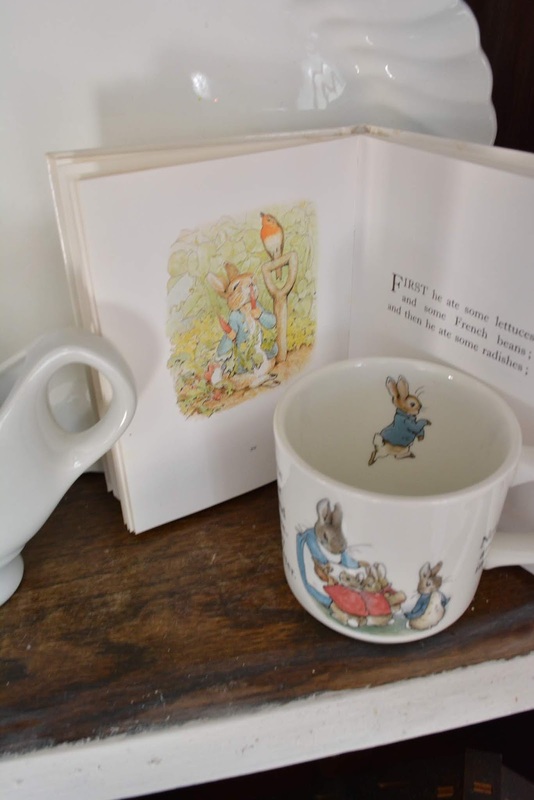 My Beatrix Potter collectables are displayed in the bookcase above the desk. 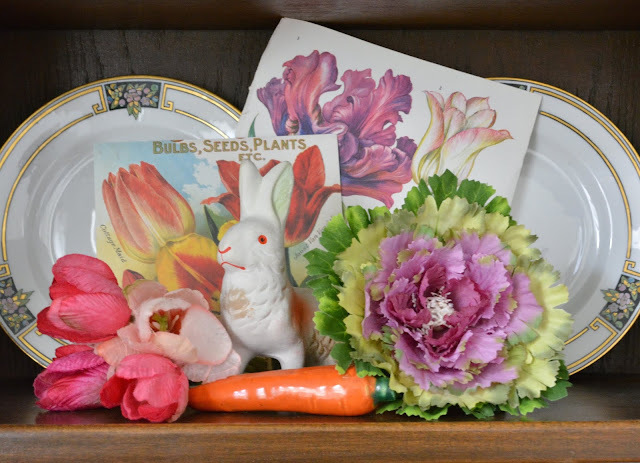 Peter Rabbit was a favorite theme when I was teaching. 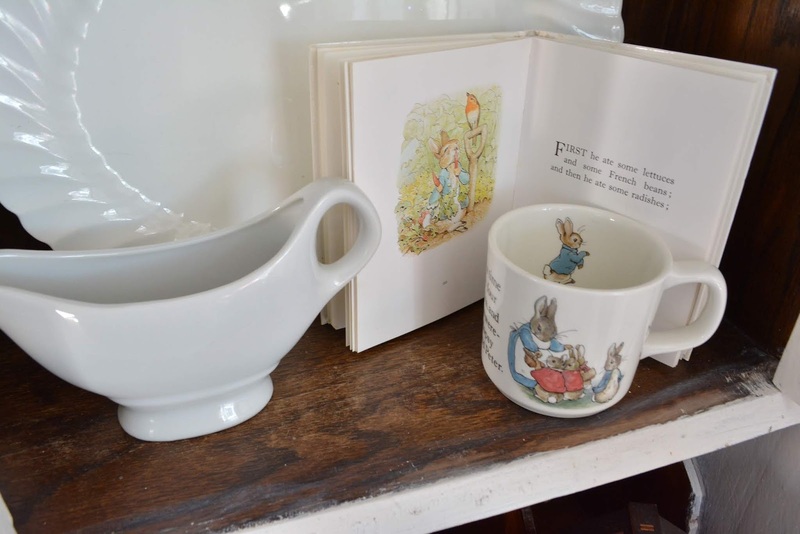 The book and nursery mugs came from our oldest son's nursery. 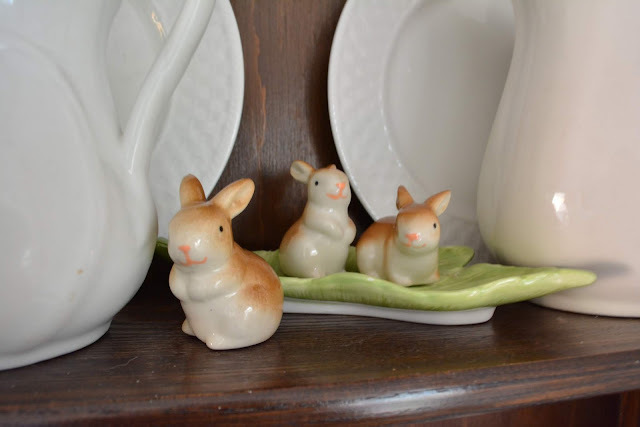 "Flopsy, Mopsy, and Cottontail" are from Hobby Lobby. These little bunnies came in a package of three last year. Here's Peter tucked behind the glass doors. Stuff is always cuter behind glass. The red truck on the bench in the garden room got some flowers in pinks and purples. A metal rabbit found at the grocery store stands guard. The dish dresser has stayed the same for a while. 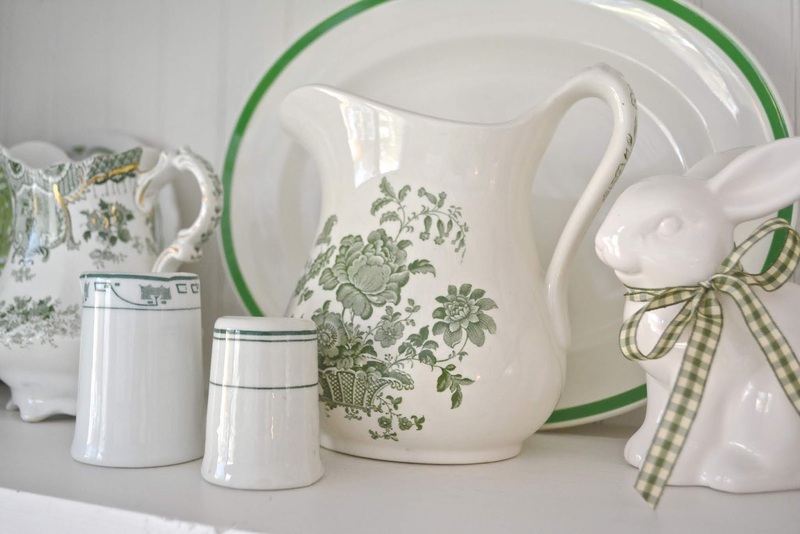 White bunnies mix well with green and white dishes. I went on a nursery planter kick a few years ago. I found about four in rapid succession. I haven't found any since. The rabbit above is my favorite but the duck below has some blue to coordinate with the dishes. I've sprinkled a few other ducklings in here and there. 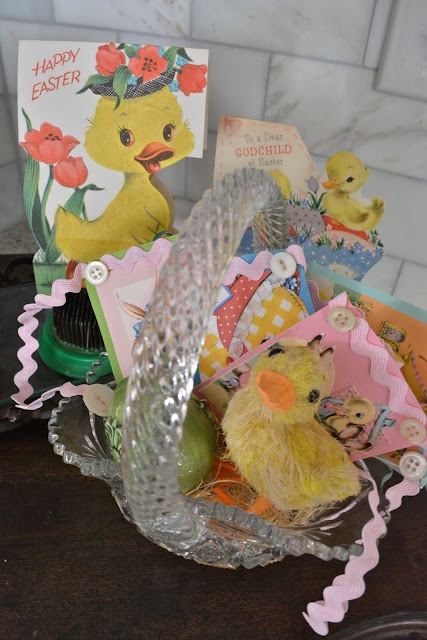 Some vintage cards from my baby book stand up in flower frogs. I just love seeing my grandmother's handwriting inside an old card. 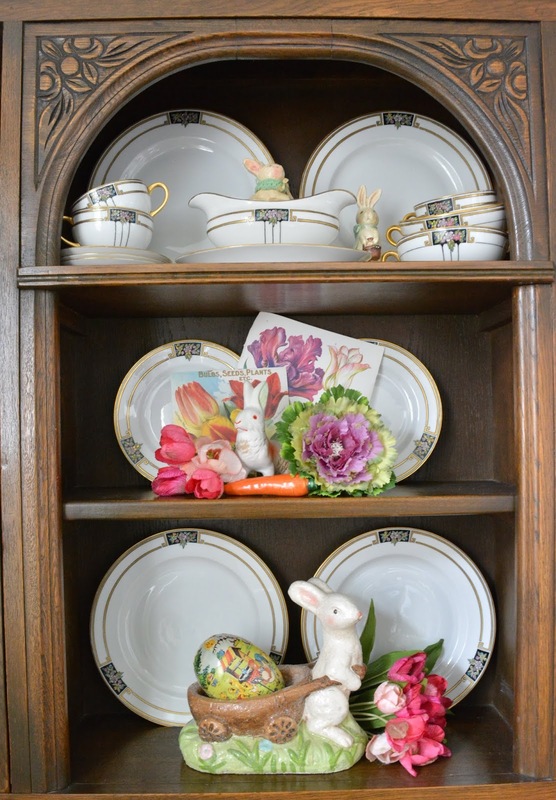 The dining room china hutch got a display full of handcrafted looking bunnies. The white one below is an early candy holder from Germany. It was a thrift store find last year. Our daughter used to have a show rabbit. 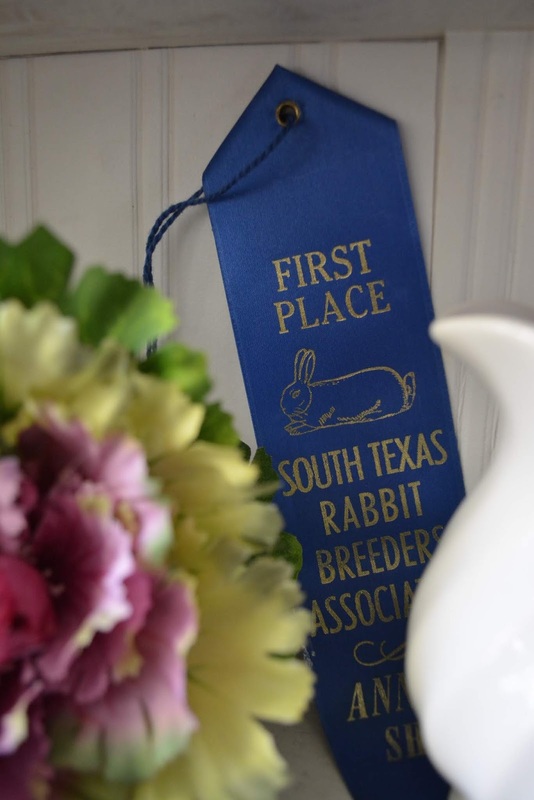 Here is a cute ribbon from one of her stock shows. 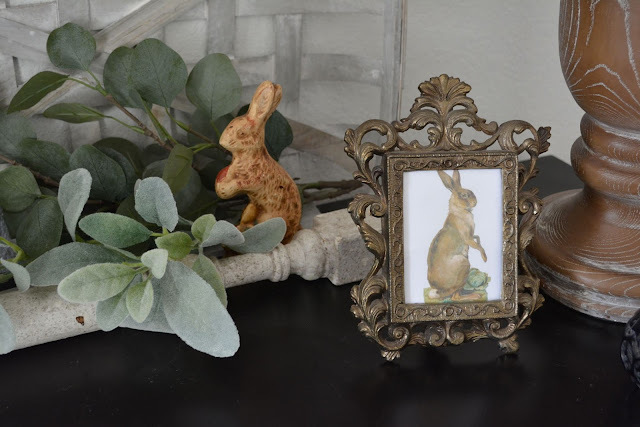 We have a few antique post cards that I pair with some rabbits with a similar look. 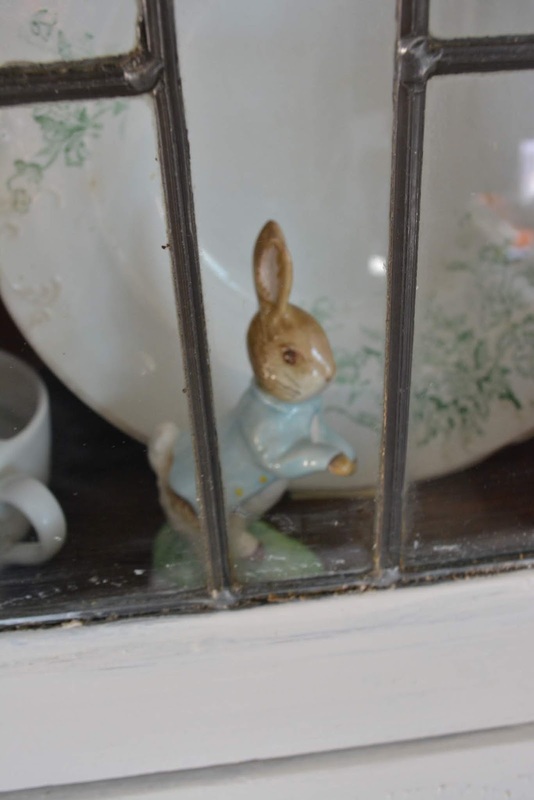 The rabbit ornament came from the Raz Warehouse Sale. Another new piece is a working chocolate mold. I found it on the same trip out to East Texas. I don't think it's super old but I just loved it. I love this postcard too. 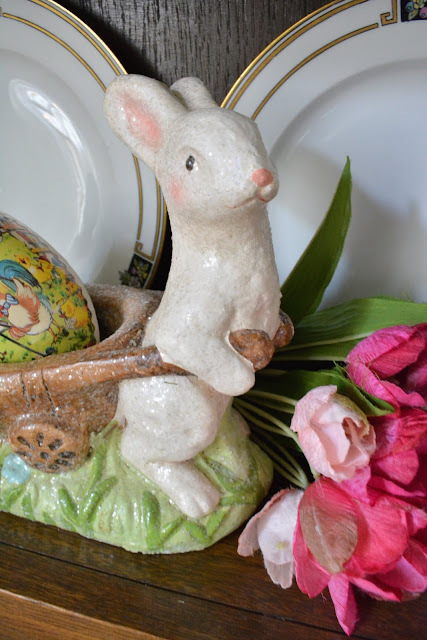 Thank you so, so much for stopping by to see our Easter vignettes. I hope you found some inspiration. Be sure to visit Carol over at Art and Sand. She always has such cute collectables. Oh my heart! The vintage images of you are the best part. Thanks for the Monday smile. Great tour, but my favorite is definitely the fun pictures of you all dressed up for Easter. Is this party ended ? I don't see where it is to join. I love the old Easter pics, they remind me of ours. It looks like such a wonderful party, but I guess I'm late. Although you are inviting today, that's why I came to check. Maybe I just don't see where Katie. Thanks for answering, in advance. Katie, your little ducklin's are so cute. Love your new addition. Great find! All your Spring/Easter decor looks so pretty and love your green dishes. Que coisinhas de páscoa mais lindas! Wow - you have so many fun and unique pieces! What a collection! I love how you have everything displayed and I love your old photographs! 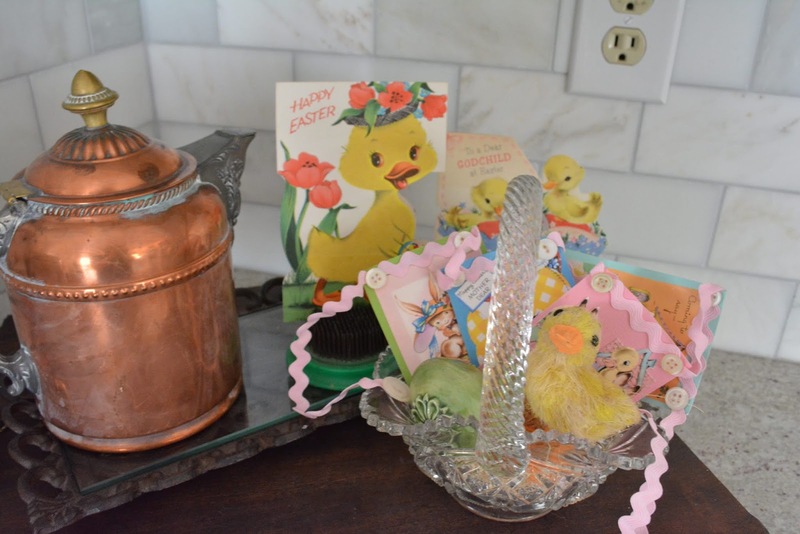 I love it all, but especially your photos, dapper duck and all the old vintage cards. I've got lots of old cards from my family when I was little and I keep forgetting to get them out to decorate with. 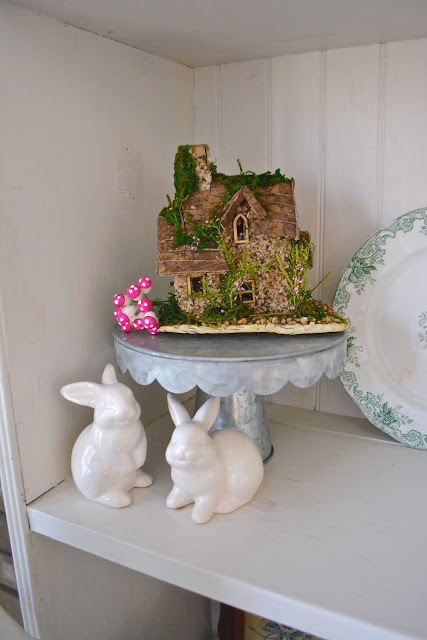 Your house is all set for Easter! 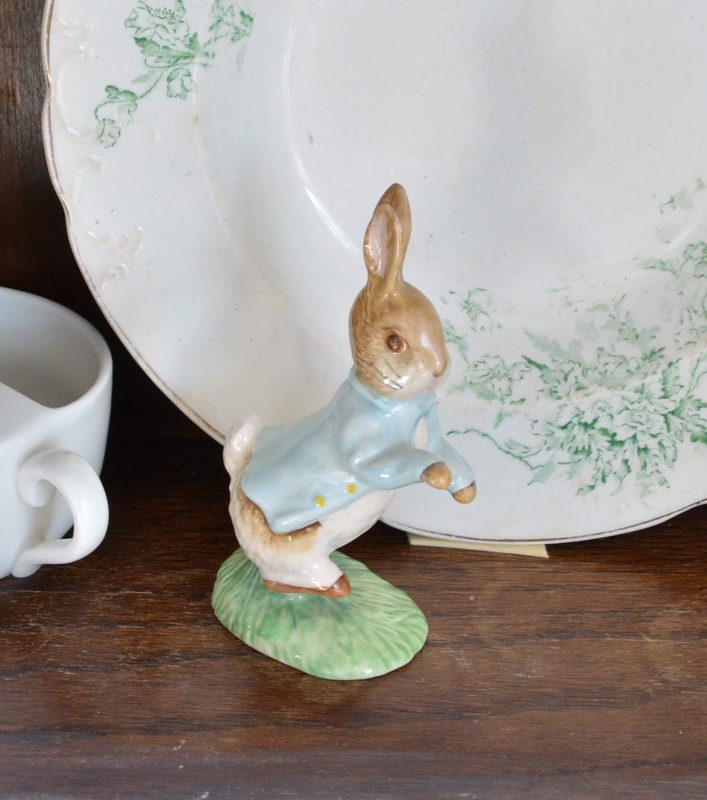 Oh yes, you do have so many sweet vintage touches in your home for Easter. I am particularly in love with your dear Peter Rabbits. Happy Spring and Happy Easter! Katie, you have the best vintage memorabilia and those photos are the sweetest! Love all the Beatrix Potter too. Happy Spring! Oh I love your Easter decor, Katie! So many sweet goodies...and I love that the cards are from your baby book! 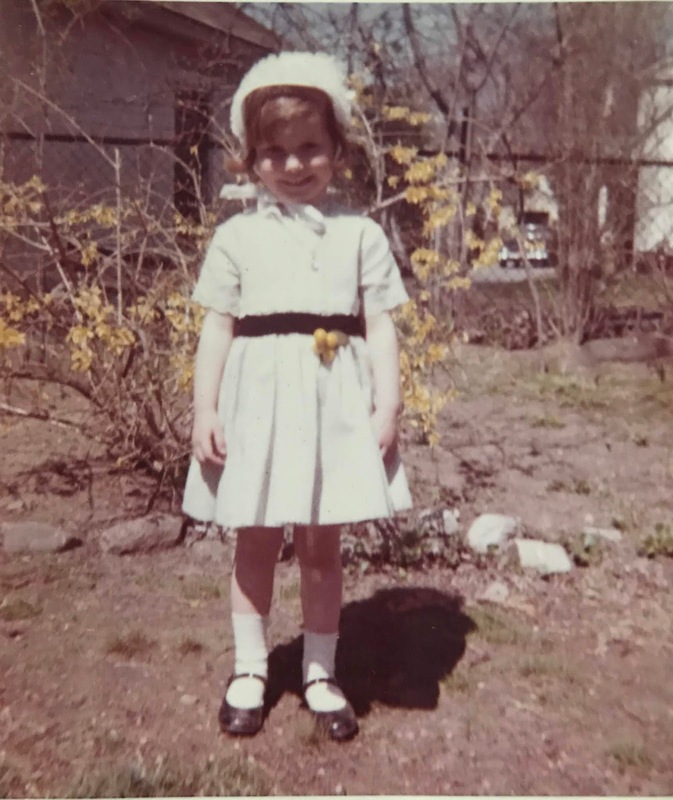 Awwww I remember well wearing my mary janes and a brand new dress and purse each year for Easter. Love all your decor. Have a great start to the new week. 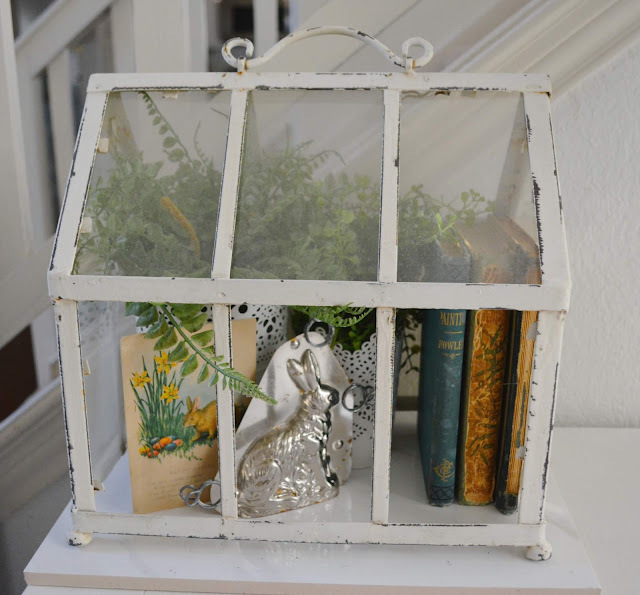 You have so many amazingly lovely vintage treasures! The fisher price pull toy is darling!!! But, my favorite part of this post, is definitely the pictures of you at the beginning of the post! Just darling!!! 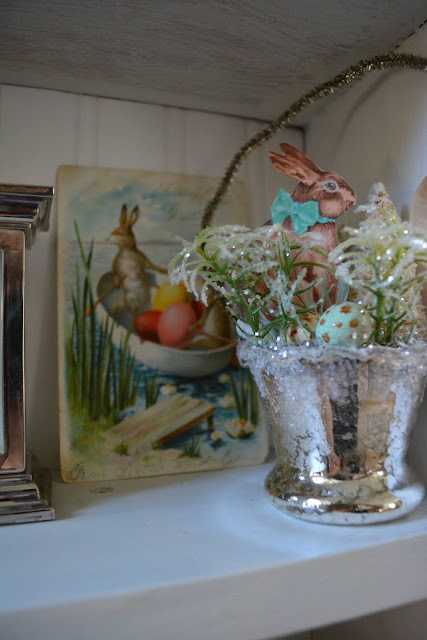 I enjoyed seeing all your vintage Easter decorations. Plus, I loved seeing your Easter photos from when you were little. 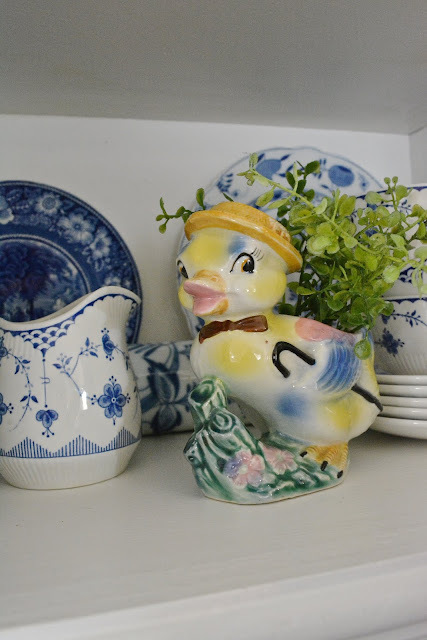 the blue and white dishes ... the green dishes ... all the little figurines - everything is so cute. Katie, what precious bunnies. It’s wonderful that you have pictures and mementos from your childhood to enjoy and display. I collected Beatrix Potter books and figurines for my older daughter so thanks for the memories. I didn’t know you could show rabbits. I loved seeing the pictures of you as a child dressed for Easter. Adorable! Katie your home decor is charming, but my favorites were the photos of you and family cards. You should frame the pix and add them to your sweet vignettes. I adore all your Easter vignettes with your vintage Easter finds! 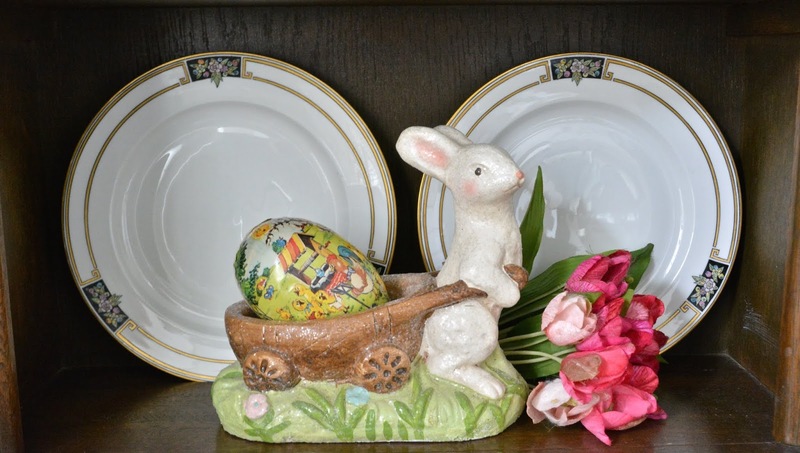 Your home is lovely and you have done such a great job decorating it for Easter. 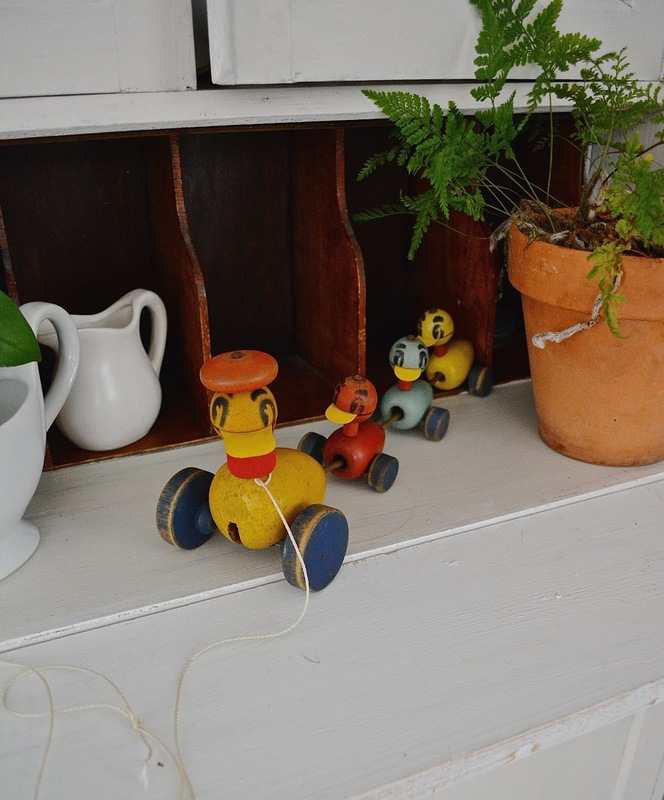 I love your collection of vintage china and toys. Your childhood photos are just adorable. I am sure they bring back wonderful memories!! 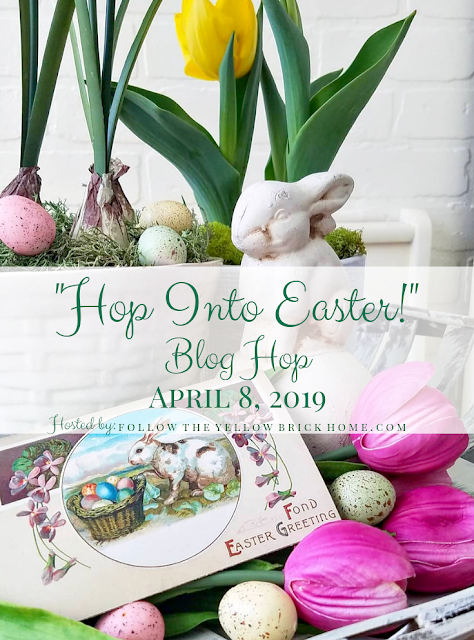 It was fun joining you on this Easter blog hop. Wishing you a wonderful spring season. Precious, precious, precious! What's not to love! You do vintage so well! 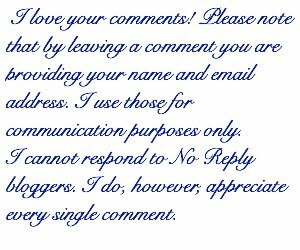 Love the little childhood pics, they added such a personal touch to your pretty post. I would hoard every item you shared! 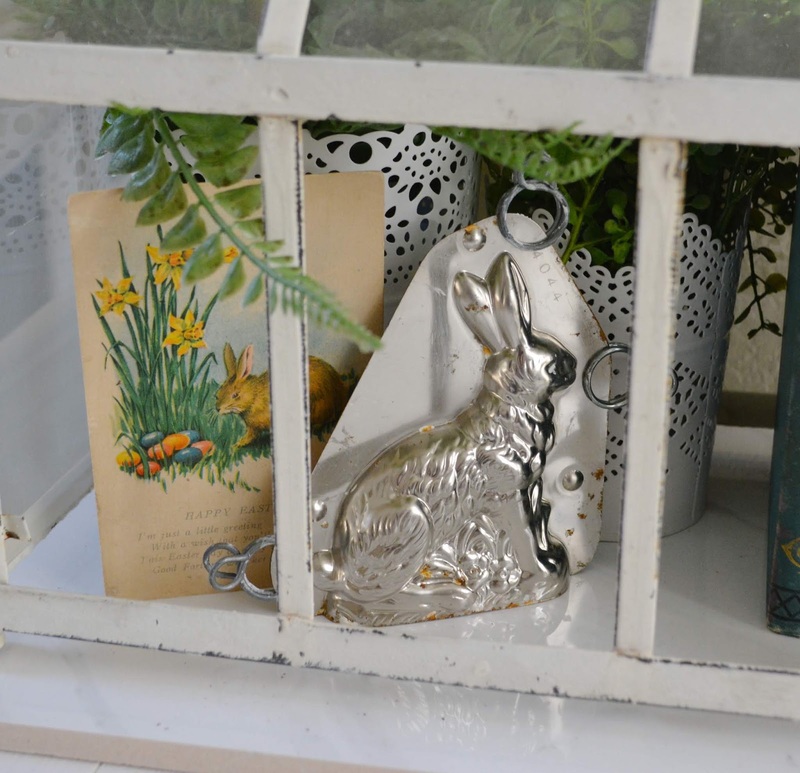 The german bunny is a real find! I am sure I have seen it before but today I really noticed the desk with the leaded glass doors for the first time. It is gorgeous, love the plants too! Thank you so much for hopping with us. Happy Easter! Katie, vintage Easter is my favorite. I love the fp pull toy, and that dapper duck is darling! Each picture brought a smile to my face!! Each vignette brought a huge smile, Katie. 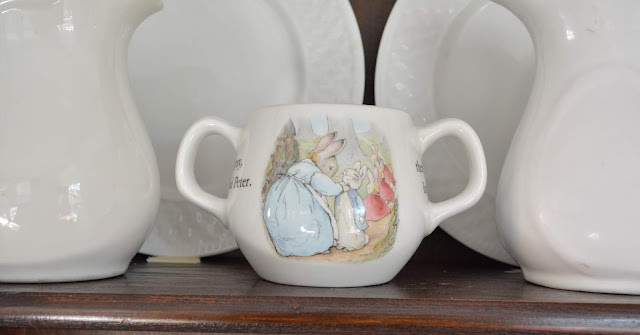 I love all the little Beatrix Potter figurines and precious cards. 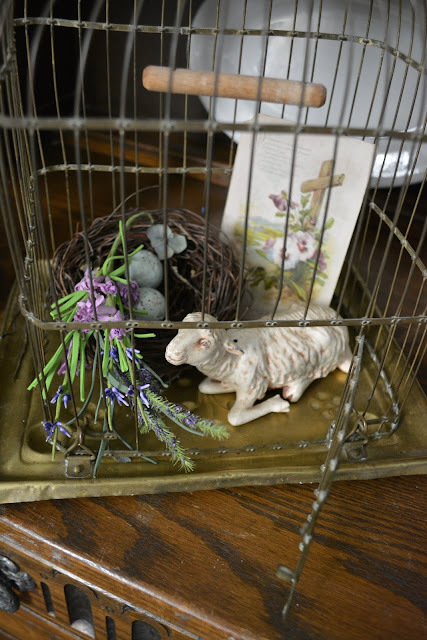 The little bird cage vignette with the lamb is my absolute favorite! Happy Easter and an early Happy Birthday! Wow, you've got quite the Easter collection! Such a treasure to have cards with your grandma's writing in them. I particularly love your laying sheep. I've been wanting some sheep for Easter decor. Will be keeping my eyes peeled! I absolutely loved your Easter tour! 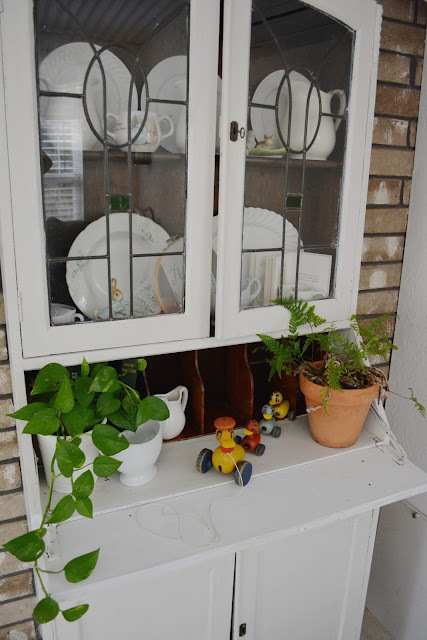 I love anything vintage and you had the sweetest vintage pieces! I loved your photos of Easter past, they sure brought back some memories for me! 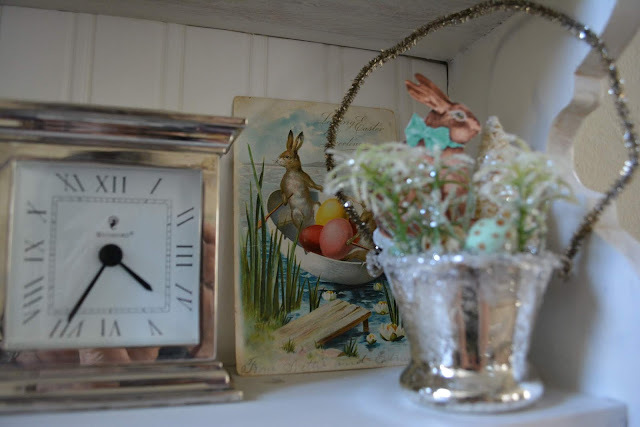 The sweet lamb in the birdcage with the vintage postcard was just darling! 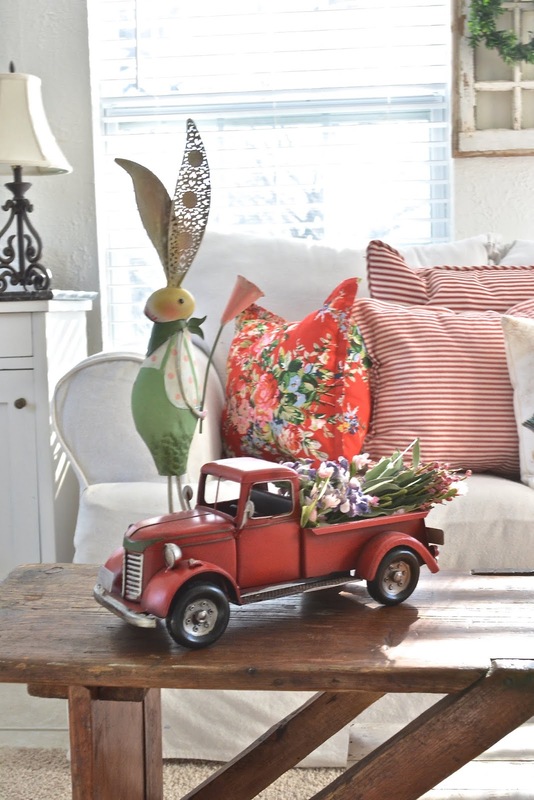 I adore all of your spring vintage goodies, but my favorite is the coffee table with the red truck! So special! 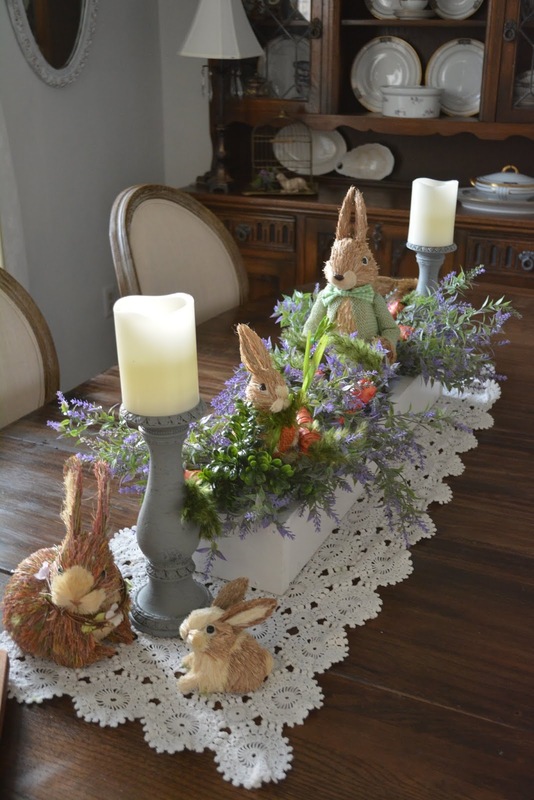 I loved seeing all your Easter decor. Happy Easter!